In a historic address  to Parliament in Canberra, India’s Prime Minister Narendra Modi suggested both countries should collaborate more on maintaining maritime security: ‘We should work together on the seas and collaborate in international forums’. Modi noted that ‘the oceans are our lifelines. But, we worry about its access and security in our part of the world more than ever before’. Both our naval forces are effective, and they aren’t in competition with each other. Common maritime challenges include counter piracy, maritime safety, strengthening port state control, and search and rescue. In his Canberra speech, Modi also singled out the opportunity for both countries to respond to regional disasters: that should include operational aspects between designated coordinating authorities. India’s already making a solid contribution to maritime security: it’s been convening the biennial Milan exercises  in the Bay of Bengal for nearly twenty years, drawing participants from across the Indian Ocean, including Australia . And for the last six years Australia has participated in the meetings of the chiefs of navies from all Indian Ocean littoral countries under the Indian Ocean Naval Symposium  (IONS) that was started by India (we’re currently the chair). IONS has the potential to serve as a broader platform discussing security cooperation in the Indian Ocean. Increased naval cooperation with India will become more common, with a joint naval exercise  next year. The last time the two navies engaged operationally was seven years ago during Exercise Malabar . And there’ll be more maritime exercises under the ‘Framework for security cooperation between Australia and India’  concluded during Modi’s visit. There’s scope too for joint capacity building in the Indian Ocean’s island states such as Maldives, Mauritius and Seychelles. Seychelles and Australia, for example, recently identified opportunities for bilateral cooperation in ocean resource management . The Indian Ocean Rim Association, which Australia chairs for another year, promotes freedom of the seas and open sealanes. 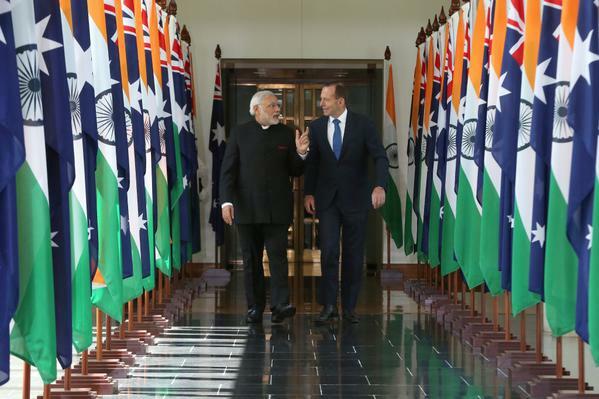 Modi noted in his Australian parliamentary speech the need for both countries to coordinate more closely in IORA. Australia and India are heavily dependent on the oceans for economic growth. So we’ve both been pushing for developing greater cooperation in IORA on the ‘blue economy’ —that is, maritime-related economic activity—as a common source of growth, innovation and job creation. As we shift our gaze westward across the Indian Ocean, there may be scope for the Indian Coast Guard and the new Australian Border Force , that will be established mid next year, to further develop the agenda of Indian Ocean maritime security. Of course, these improvements in Australia–India relations come at a time when both governments already have crowded agendas. In Australia, the Abbott government has made no secret of its intentions to strengthen the bilateral relationships it enjoys with Washington, Tokyo and Jakarta. But, it would like to do more with India too. India, on the other hand, is looking east and building ties with Japan. And, as outlined above, there’s a shared agenda of work and interests already available. The real test will be whether both Canberra and New Delhi are willing to make it work. Anthony Bergin  is deputy director of ASPI. Image courtesy of Twitter user @TonyAbbottMHR .